We are delighted to announce the winners of our latest ‘refer a friend’ competition. From thousands of entries Natalie, and the person who referred her, were randomly selected, winning their mortgages paid for six months by L & C Mortgages. Natalie was automatically entered into our competition when she contacted us for remortgage advice and mentioned her Aunt – Maureen had recommended us! Many new L&C customers come to us through referrals from existing customers – who tell their friends about our fee free service. Twice a year we randomly choose two lucky winners, one existing L&C customer and the friend they recommended. 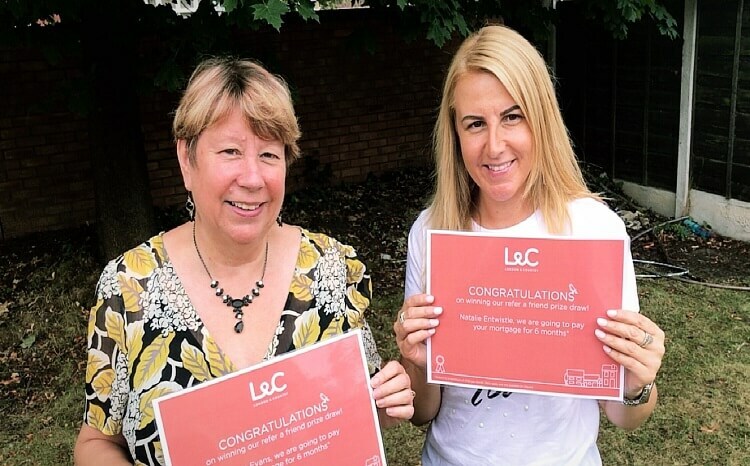 Here’s what our winners; Maureen and Natalie had to say; “We are delighted to win this prize as we didn’t think that things like this happened to normal people like us, we’ve never won such great prizes”. “We still can’t believe it – it’s great news, thanks very much”. Interested in referring one of your friends? Find out more here.